Need rescuing from alert anxiety? Tech to get me away from tech, wearables to stop me glancing at my smartphone, eyes up gadgets with no screens. Altruis is a modular smart jewellery system from London-based Kovert Designs that wants to help us all go on a digital detox. What does that actually mean? The idea is to keep us connected without being a slave to the buzz of our phones. Recognising that sometimes I want everything: I'm talking all of the internet in my face, all the time. And sometimes I just want to take a step back, cool off from the cloud and still get the message that my friend is on the way to my flat for martini and lemonade hour. I've worn so many smartwatches over the past 12 months that when I get used to a device that handles notifications, my relationship with my smartphone changes subtly, my alert anxiety lessens and the number of times I check it each day plummets. I've been wearing Altruis for over a week and it's safe to say the smart jewellery has not just repeated but enhanced the trick. 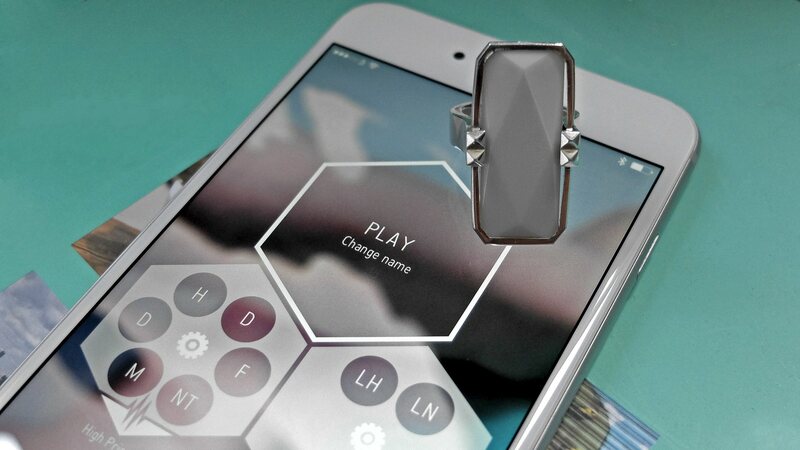 Altruis is a smart stone made from zirconia ceramics which connects to your smartphone - iPhone only for now - via Bluetooth Smart. It subtly vibrates on your finger, wrist or neck when you get priority notifications. That's it. It's really that simple. No LEDs, no beeps, no display. And before you cry 'but your phone is in your pocket, you can feel it vibrate' - just remember - some of Kovert's target female audience will (like me) mostly carry their phone in a bag due to a lack of pockets. The stone itself contains only an electronic circuit board, rechargeable battery, vibration motor and sensors and works with a modular range of jewellery. For the first range of products, named Cleopatra, Kovert has made two smart Altruis stones in black and white ($180 each) as well as the Cleopatra Ring, Cleopatra Bracelet and Cleopatra Necklace in a variety of materials including black cord and sterling silver plated in gold, rose gold or platinum. The jewellery, including an Altruis stone, starts at $300 with the most expensive pieces at $590. As for the notifications, these are handled and customised in the accompanying Kovert Designs app for Altruis - more on that later. High priority alerts get three short vibrations, low priority just the one. Kovert claims the battery life for an Altruis stone is two to three weeks, depending on use. After just over a week, I'm down to 61% battery so I'd say it's closer to two weeks for how I've had it set up. That's still impressive and twice monthly charges is more than manageable for the benefits it offers. Charging is via a magnetic USB cable which connects to the underside of the stone - you don't need to take the stone out of the ring to do this but connecting a charger does ruin the jewellery illusion somewhat. I'd love to see a Kovert designed wireless charging dock that can sit on my bedside table next to jewellery boxes with pretty but dumb pieces inside. I've been wearing the sterling silver Cleopatra ring with a white Altruis stone ($480) but as I mentioned earlier, the range allows for plenty of personalisation with a total of 18 different combinations to choose from. Once you've bought one piece, you can buy more accessories separately too and swap the same stone about from ring to bracelet to pendant. The ring itself is flawlessly designed - the sterling silver band is wider and sturdier than some, to balance the weight, but on a par with costume rings with big stones. The rectangular zirconia ceramic stone is cut into a modern, geometric shape on the top edge which helps it to catch the light slightly. It's held in place by leather pads and framed by four small pyramids. Altruis is difficult to miss due to its size but also stylishly minimalist. Fashionistas worried about wearing a gadget on their wrist with the Apple Watch wouldn't even guess this was wearable tech. It's a good size stone for a necklace and bracelet but as I hinted, it would be great to see a slightly smaller size too that will suit those who just want to wear Altruis as a ring. It does tend to weigh the finger down a little too after wearing it all day. On another practical matter, thanks to polished plastic on the underside of the stone, Altruis is splashproof, which is handy. Having worn the Misfit Swarovski Shine, the Netatmo June, Opening Ceremony and Intel's MICA and a prototype of a Trellie ring, I can easily say that Altruis is the smart jewellery I've wanted to wear the most each day I've been testing it. It says a lot about the design that I would wear the range even without the smart capabilities. Everyone will coo over different combinations (I like the black stone with rose gold plating) just like with regular jewellery. Kovert Designs' CEO Kate Unsworth has said in the past that she'd be happy for customers to buy Altruis for its style statement and then discover its tech credentials. Come for the pretty accessories, stay for the digital detox. The app for Altruis, which is named Kovert Designs not Altruis in the App Store FYI, is iOS only for now - iPhone 4s or later and we'd love to see Android support as soon as possible. This is where you can set up and sync your stone, check its battery life and update the firmware. It's also where you have to do a bit of work to get the best out of Altruis. Most wearables give you a long list of apps to decide which alerts you want to come through. Or just bother you with everything. Not Altruis - its whole raison d'etre is to allow you to live your life away from e-hassle. So in the app you have three hexagons - work, play and keywords. Work and play are profiles which you can rename - they worked for me - and alter by pressing the settings icon. Tapping the profile activates it, each will say active or not active at any point, but this takes a little getting used to. I repeatedly tapped 'Work' with a view to adding another contact then realising I've just switched it off. In each profile you're presented with two further hexagons - high priority and low priority. Within these you can add contacts, link up their WhatsApp profiles and also add WhatsApp groups by name. These appear as bubbles with first initials for a quick glance and though it looks pretty, only six will fit on the main screen which isn't overly helpful. Keywords can be active at the same time as one of the profiles or on its own and lets you specify two words - one high priority and one low priority. So for instance my high priority word this week was Wareable which was silly because no-one messaged me anything important about the site and named it. But I can see it being really handy when I'm expecting one important message or email (contacts include email). And in theory you could tell loved ones a codeword to type so they know they can get your attention on holiday, for instance. And that's it, deliberately simple and easy to get along with. I'm sure Kovert will add more features in the future but not too many - that would detract from the original goal. I'd love a kind of 'high priority plus' setting for one specific contact or keyword, for instance. And I'd also like to be able to drag and drop contacts from high to low priority or across profiles. Plus what of Facebook messages? I still use those. I don't want tweets and Instagram alerts, exactly, but Facebook seems a bit of an oversight. But hey, now I'm just being a diva. So has Altruis changed my life? I must say I'm definitely its target audience - I check my phone way too much, get FOMO easily and write things like 'find time to concentrate' on to-do lists in Evernote. I wore the Cleopatra ring on a night out and left my phone in my bag for pretty much the entire night - my sister was a bit ill so I didn't want to miss a text. With her set as a high priority contact in the app and no buzzing on my finger, I knew she must be sleeping and felt free to unwind safely. It even impacts small things like walking across the office to get a glass of water or go to the bathroom or leaving your phone to charge in a bedroom while you're eating dinner. A lot of us are guilty of allowing one small part of our brain to wonder what's going on on our phones at all times. If you're working hard for a promotion, can't get enough of the cute guy you're seeing or a loved one is ill and you want to keep in contact, you don't want to miss something important. But most of what we allow to interrupt our day isn't important – and Altruis genuinely keeps this balance in check. Wearing Altruis is like having Karlie Kloss dressed head to toe in Céline guarding your door, telling people to go away, a gorgeous gatekeeper making sure you've got time for you. It's hard to 'get' that if you just see this as just a $500 ring that buzzes. It's a wearable for those whose life is crowded, hectic and in need of a stylish slice of assistance. Altruis doesn’t pretend to be anything it’s not - it’s a lovely looking smart jewellery system with high end prices to match its high end design. It might essentially have ‘just’ one function but what it can offer - peace of mind while still staying hooked up to the internet - is arguably much more likely to improve your life than say, ten questionable smartwatch features. Simple, stylish and desirable, Altruis could just be the future of jewellery.